NITSA: It’s not Water that Inspires Blueness of Jodhpur!! It’s not Water that Inspires Blueness of Jodhpur!! Well said that while the rest of the world meanders through the regular, Travel enables you to enjoy life filled with privileges. And here we are ready to explore all the privileges that travel has to provide us. It provides privilege to access even the smallest corners across the world and to experience the warm welcome from varied people and culture. Quite Visible why Jodhpur is also a 'Blue City' !! 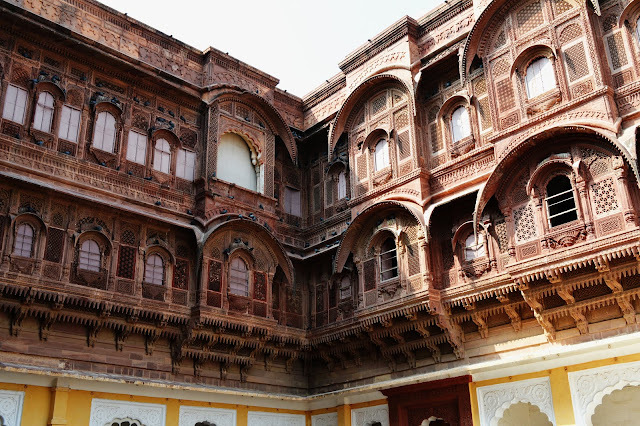 While on the road trip to Rajasthan, it is time to share my experience about the warmness of Jodhpur. We are travelling to Jodhpur via Ajmer road which again provides you with the best of the natural view. You will be encountering total of seven tolls on your way to Jodhpur via Ajmer costing Rs 110, Rs 35, Rs 30, Rs 20, Rs 40, Rs 40, Rs, 40 respectively. Afternoon time and empty tummy left us wondering for a decent place to lunch at. Victory was achieved after crossing the fifth toll (Around 150 km from Udaipur), when we found ‘Shuddha Shakahari Bhojanalaya’ in Somjhi Village (10 km before Pali on the main road itself). It is no doubt one of the tastiest treat in the entire Rajasthan. You may find this place little cheap at first look, but our hunger made us find this place, which now I recommend is a ‘Not to Miss’. We ordered our all time favorite Daal Tadka, Kadhai Paneer, Naan, Tandoori Roti and Kadhi Chawal with a bill of Rs. 650/- only for 6 people. With the help of Google Maps, we have successfully reached our destination in Jodhpur ‘Kothi Heritage’ (click to book from here). 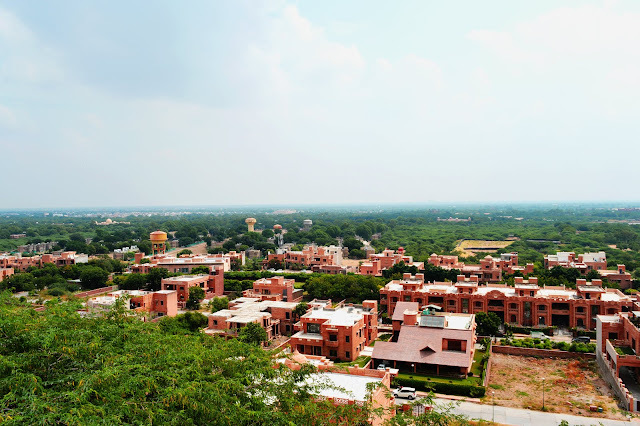 Don’t get confused if Google takes you towards residential area in Jodhpur, this Kothi Heritage is situated there only. As we reached, the people there helped us park our car and welcomed us with garlands. We were quite impressed with such a warm welcome. As we stepped in towards reception, the inside beauty was just mesmerizing. Well named, this place is designed in a palatial manner with all antique and ethnic items. It is going to provide you a royal Rajasthani feel. This property is owned by a family, who used to reside at this place few years back. We did get a chance to meet the owner of the Kothi Heritage. He is a very polite man and a decent person. Just after the reception, there is a hall which covers all in one- Waiting area, small gaming zone for kids and also a place to dine at. It may be a small place trying to cover everything, but it didn’t let us feel clumsy at all. Rooms were quite big, nicely designed, very neat and tidy, all the necessary items available in the room and washroom including soap, moisturizer, comb, toothbrush, razor, shampoo etc. We got the room on the back side of the Kothi Heritage. There is tree on the back side of Kothi Heritage which is a real terror after evening. No. No. Not to worry. There is nothing to panic about. This is just because of the birds living on this tree makes lot of noise which scared us a lot. So one suggestion if you can ask for a room away from that tree. The food there is also good. We did order few snacks in the evening after our arrival. 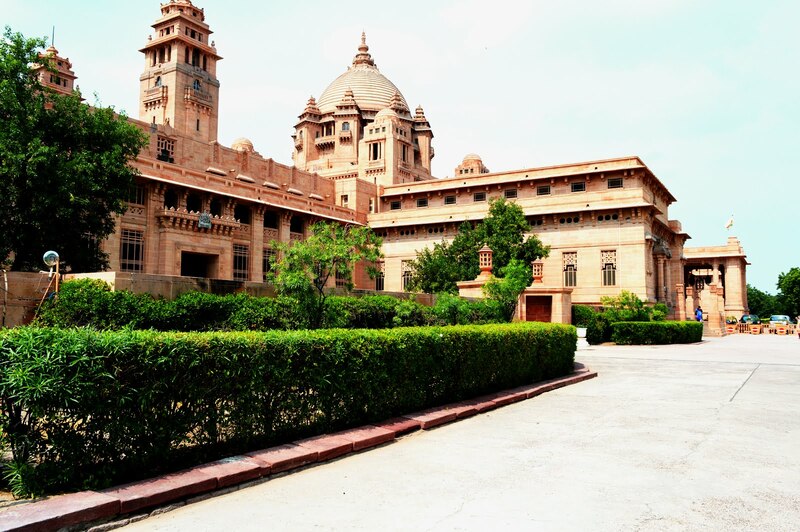 Umaid Bhawan covers the largest land area in Asia, whose only one-third area can be accessed by general public. It is one of the beautiful palaces in Rajasthan. This Palace actually has got three sections. First one is the residence of the king and his family itself, second is the Hotel (Umaid Bhawan Hotel) and the last one is for general public opened up as Umaid Bhawan Museum. Guides are also available inside and outside to explain you about the bhawan and museum, But I recommend not going for any of the guide. Everything is written out there. Guide charges vary from Rs 50 to Rs. 100. Museum charges you an entrance fee of Rs. 30 per person. 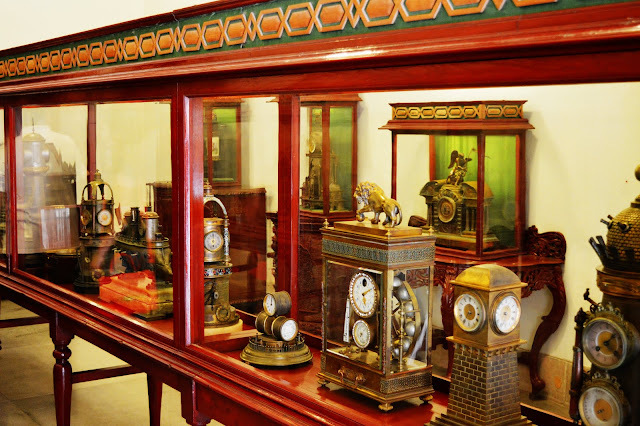 The museum has got a nice collection of ethnic utensils, accessories, paintings and watches too. Collection of vintage cars can also be seen there for which proper separate section has been prepared by them known as ‘Vintage Car Collection’. Snack shop is also available inside and outside the museum. Place is good to enjoy and you can spend your 1 to 2 hours very easily. There is no facility of air conditioning or fans inside any of the museum/fort in Rajasthan. Make sure you have plenty of water with you. 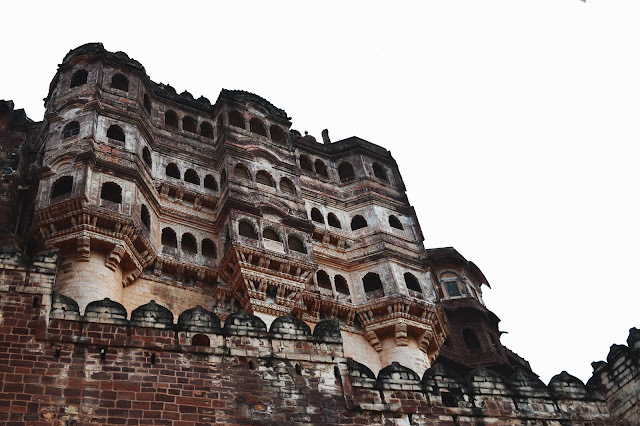 Mehrangarh fort is situated on hilltop providing you with a mesmerizing view of the blue city. 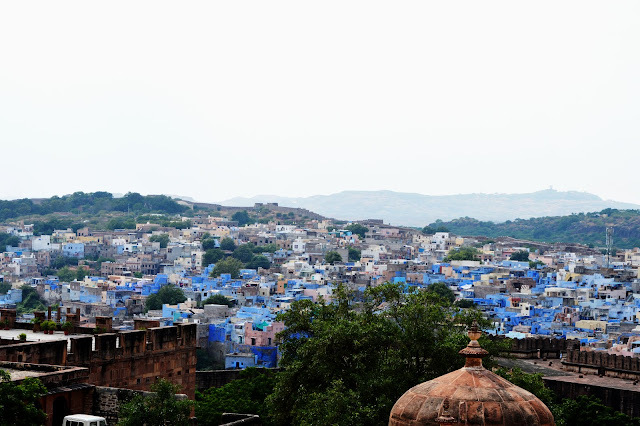 The city is named as blue city for the reason that all houses are painted in blue which is visible from here. The fort is a 5 to 10 min climb up the hill. The climb can be very tiring if you are not prepared for it. So plan accordingly, else there is an option of elevator for which tickets are available there. Guide is not required here also. Everything is written out there on walls. A small cafeteria is available inside the fort. Make sure to carry plenty of liquid with you else it can leave you dehydrated. 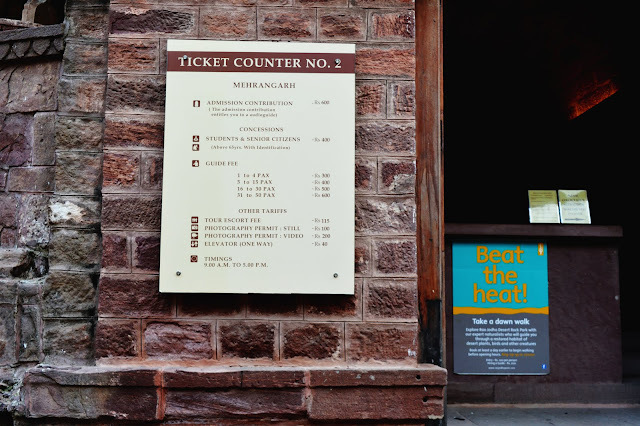 Entrance ticket to Mehrangarh fort is of Rs. 100 per person and Parking Charges is Rs. 40. 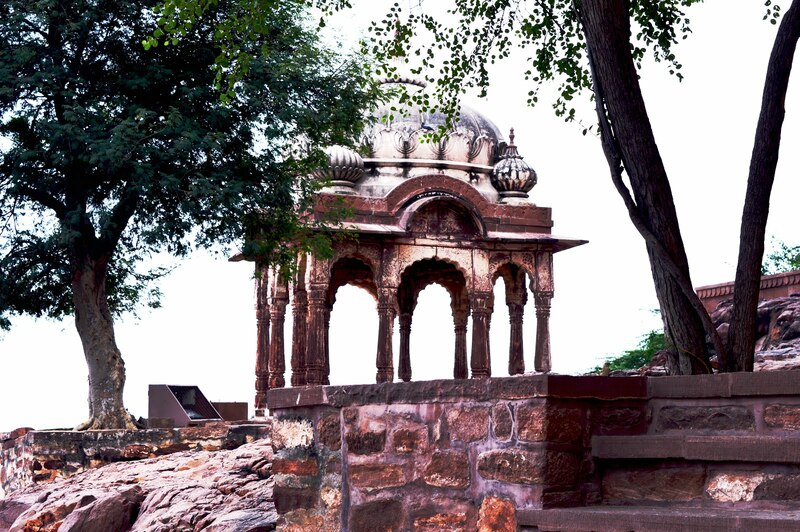 Not to miss visiting this fort is a very beautiful historic architecture. 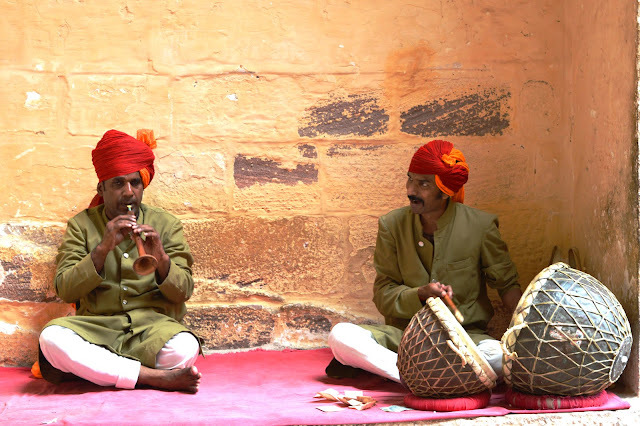 Singers were also there at the entrance of the fort singing Rajasthani cultural songs. We spent some time to listen their soothing tunes. One thing which was very unique about Mehrangarh fort is that it has different pathways for women and men. Both need to go separately to visit one temple situated at this fort. Drinking water on the way to temple is also available for free. Visiting museum has no such boundation. The Currys is one of the most famous dining places of Jodhpur. We searched for this restaurant on Google and following Google maps we reached the area where it is located. It is a roof top restaurant also providing you with the beautiful view of Mehrangarh Fort. Almost all the restaurants in Jodhpur are roof top restaurants. Many more restaurants were also there adjacent to each other. All were looking fabulous from inside. A guy was there to show us the path to reach the roof top. As we reached the roof, there were two option of roof top available. a. One arrangement which was open from three of the sides and providing the view of the fort. b. Another can be called as ‘roof on roof’, which was open from all four sides. Both options are available for all. They lighted up the candle to give us the feeling of candle light dinner with fabulous fort view. The menu was filled with lots of food items. We ordered Chinese, mock tails and few of the snacks. The food was good. We also enjoyed the antique wooden swing kept on the roof. It was a dark and romantic feeling dining at this place. Gypsy is another very renowned dining place in Jodhpur. It is famous for its ‘Rajasthani Thali’ and buffet system. You can eat as much as you want. This restaurant is mostly famous among Indian visitors. Other food items are also available here. I would also rate its service and ambience as good. Besides all these, we also went for a drive at night on the roads of Jodhpur. We also explored ‘Clock Tower’ nearby to our hotel. 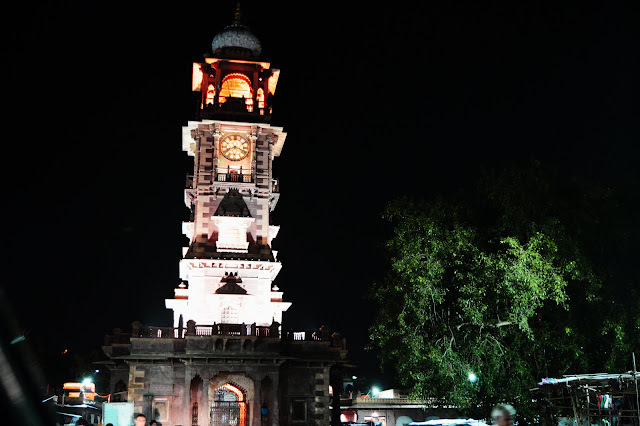 It is located in the market area of Jodhpur. The market is also very fascinating. Mostly ethnic items are available there and it was also decorated in ethnic style which was quite impressive. There were lots of sweet shops nearby from where we bought sweet and salty snacks.